Welcome to Sunday all and today we have a well lets call it a cyber thriller for you . SANCTUARY OF LIES by Chad Bishop. Ruthless businesswoman, gifted programmer...devoted mother. To protect her son there are no rules, just his safety. Simone Johnson is a gifted programmer, a ruthless businesswoman, and a devoted mother. When someone steals her code and threatens her son, there's nothing she won't do to keep him safe. 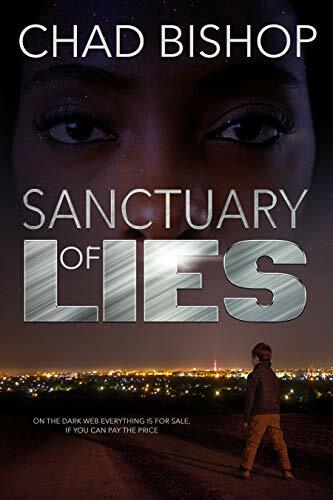 She's blackmailed governments, brokered deals with criminals, but to protect her son from a killer she'll face her biggest challenge yet, asking her ex-husband to help protect the son he never knew he had. 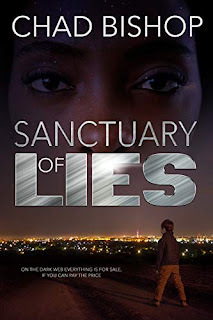 Buy Sanctuary of Lies to start the Chest of Secrets series today! This is the first book in a new series . What would you do if you are a devoted mother and also gifted programmer. When a hacker steals the code she wrote and decides to steal a plane . She is threatened and now has to keep her son safe. She has blackmailed and done deals with criminals . The biggest challenge she has to do is as her ex to help keep her son safe. The son he didn't even know he had. But is the sanctuary the best place to be. This is an edge of your seat thriller . You will get sucked into the mystery . The author throws us into the middle of a huge scare and takes us on a thrill ride . There is a little bit of jumping around between characters and few times I got lost when he did that Over all truly enjoyed this story and loved the intrigue and the twists and turns kept me reading all the way through. So if you want a good read for the winter reading list . check it out . Its a good start to a new series .